I don't want to turn this blog into the Jerry Goblin Blogathon or anything, but 24 hours after the last post went up we had already raised $1,000! That's quite a feat, and nearly a fourth of the way there. As of this writing, 48 hours later, things have slowed a bit but we have raised $1,250 in total. I was thinking that if the anteater is a girl, we should call it Coraline or Coraline Gaiman. It fits in with the release of the movie. Good for branding. An excellent point! We shall have to vote on a male and a female name in order to cover all of our anteater bases. 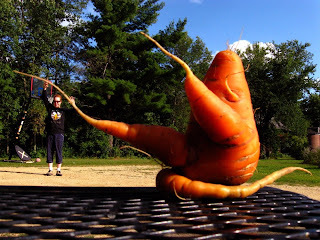 The ever-Fabulous Lorraine has grown a carrot with vegetable identity disorder (VID). Between this and the devil tomato, you have to wonder what unholy energeries are trapped in Mr. G's soil. Was an Old One summoned on the spot where his garden now sits? Does his house sit over a Hellmouth? Mr. G writes to mourn: There are a couple of Birdchick blog entries in my garden, about banding and Orioles. They made me homesick. Very unfair that I can see her blog but not my own. Ah well. You could link to the Oriole and the kestrel, maybe? I have added the details for the Philadelphia stop of the GRAVEYARD BOOK US Tour. Colleen Doran has a page of original Sandman art up for sale on eBay. Those who pre-order Who Killed Amanda Palmer will receive a code enabling them to download "I Google You" (lyrics by Mr. G). Mr. G's story, "Bitter Grounds", is reprinted in a new anthology, The Living Dead. Labels: all your anteater bases are belong to the staten island zoo, give Colleen Doran money so she'll do more A Distant Soil, touched by its carroty appendage, who actually did kill Amanda Palmer?